Multiple Group 1 winner Black Heart Bart is free from any feet problems that hampered him during the Autumn as he prepares for his 2018 Spring Carnival opener in the Group 3 $150,000 Bletchingly Stakes (1200m) at Caulfield on Saturday. Black Heart Bart, above, heads to the Bletchingly Stakes at Caulfield with no feet problems. Photo by Ultimate Racing Photos. Black Heart Bart went through his paces on a soggy Mortlake track this morning with a host of other Darren Weir trained horses and stable foreman Jarrod McLean said the seven year old gelding came through the work unscathed. “He’s going really well and we’re very happy with his soundness,” McLean told racing.com..
“It’s very heavy out there (Mortlake) this morning and he’s a horse that doesn’t perform at his best on that ground but it’s probably good for his training. He’ll come through it well with no concussion on his feet, which we have had problems with in the past. “He’s coming to hand well. He’s only had the one really soft trial at Coleraine last week. “The option is to go to the Lawrence after another trial but Weiry just felt after Coleraine he would get more out of a day at Caulfield under the weight-for-age conditions and then progress to the Lawrence after that and hopefully he will be cherry ripe to run as well as he can in the Group 1 Memsie third-up. 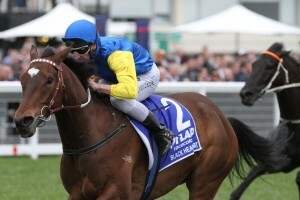 Black Heart Bart’s early Spring Carnival program will see him head to the Group 2 $200,000 P.B. Lawrence Stakes (1400m) at Caulfield on August 18 after the Bletchingly Stakes and then onto the Group 1 $1m Memsie Stakes (1400m) at Caulfield on September 1. Black Heart Bart was the winner of the 2016 Memsie Stakes and then finished second to the Lindsay Park trained Vega Magic in last year’s version. Weir nominated five horses for the Bletchingly Stakes and as well as Black Heart Bart, Voodoo Lad, Man From Uncle and Camdus are a chance to line up in the weight for sprint while young gun Nature Strip is heading to Adelaide for the Listed $100,000 Lightning Stakes (1050m) at Morphettville.